Looking back from my vantage point now, I’m not so sure that the voice I heard then was actually God’s and that is not because the experience has faded from my mind over time. On the contrary, it remains very vivid to me. The reason I’m not sure it was God’s voice is simply because I cannot prove that it was God’s voice. I was young, still in high school, and had no consistent employment. I was into clothes at this time so I went shopping and put a bunch of stuff on lay away. It was a matter of time before I felt I could save up the money to pay the remainder off. Weeks turned into a few months and then more months and still no sign of consistent work to earn enough to pay off my clothes. So, I started complaining…to God. Apparently, I felt it was His fault because He had not come through with a job to let me get my clothes out of lay away, so to speak. My complaining to Him became the norm. Every chance I got, I would remind Him (in my head, through “prayer”) that my clothes were still waiting to be paid for and what was He going to do about it? There was nothing humble at all about my approach to Him. In fact, I was quite arrogant. One day, I was in the bathroom taking care of business and with nothing better to do, I began to once again complain to Him. All of a sudden, things got very quiet and it was as though I had been interrupted even though I had been talking out loud. Out of the silence, I heard a voice ask me a very pointed rhetorical question. The question was, “Did I tell you to buy them?” It was simple and effective. I shut up. Instantly. I never complained about my clothes again and it was several more months before I finally earned enough money doing odd jobs to finish paying for them and get them out of lay away. Was it God who spoke to me? I used to think so but now I’m not so sure. It could have been, but it could also have either been my own vain imaginings or the devil himself. The logical question is why would the devil impersonate God in that instance since it was an effective and therefore accurate response to my constant harping on God, blaming Him for a situation He had no hand in creating? Because I complained so much, could God have been the One who responded to me directly? It’s certainly possible, but I’m not sure why He would. Could He had also allowed a lying spirit to come alongside me offering me something that would make me sit up, take notice, and respect that “voice’s” authority? We have at least one example of this in Scripture in 1 Kings 22, where God actually sent out or allowed what is called a “lying spirit” to confound the situation regarding Ahab. We also know Satan is the father of lies. Even though this wasn’t a lie in and of itself, if the spirit was not of God, that meant the spirit was impersonating (lying) God. So even though the answer seemed truthful, the source was not. In the New Testament, Paul warns us that Satan’s modus operandi can be so seemingly authentic that his deceptions are extremely difficult to uncover at times. Satan is literally able to transform into an angel of light (2 Corinthians 11:14). Look at the ways in which Satan has approached people in Scripture. At first, it seems so innocuous or truthful, but eventually turns out to be revealed for what it is with destruction as the result. Consider Genesis 3. Look at how truth was mixed with lies in Matthew 4. Jesus did not succumb, but what about the rest of us? I honestly do not know if that was God’s voice I heard that day, but I think it is better to assume that it either was not or if it was, it was a “one of” and not the type of normal discourse that God expects us to seek. Though many today teach that this should be the normal life for every Christian. In another instance, I had received a card in the mail asking for donations so that Bibles could be given away. This was not Brother Andrew’s group, but another group. I thought it was a good thing and promptly filled out the card. I noticed that if I donated a certain amount, I would get one of those Bibles myself. Cool, so that’s what I did. I was going to mail it, but “something” inside me made me feel awkward about it. So I set it aside and kept wondering about it. I also started asking God the same question repeatedly: what did my “feeling” inside me mean? What was I supposed to do? I promptly got up, went to the card, and tossed it in the trash! There, I felt better about it and promptly forgot it. As far as I was concerned, God had answered and that was that. No need to think about it anymore. But what if it was a lie and the organization did exactly what they say they did? Can I prove I heard God’s voice? No. Hearing the voice inside my head made me feel as though I was hearing from God and if from God, then it was true, end of story. But the reason I question these incidents now is due to the nature of the answers to the first and second questions. In the first instance, the rhetorical question given forced me to see the truth. The truth was that I had simply gone on ahead and put lots of clothes on lay away. When I didn’t have the money in short order, I began to blame God for that lack but it was not God’s fault. The question, born of a complete lack of humility, could have come from God, my imagination, or the devil. But because it seemed to direct glory to God, I decided it came from God. But I do not know if that was the case. I cannot prove it one way or another from Scripture. By the time the second response to my querying came, I had already heard the voice once and it had seemed truthful. Why would I doubt it even though the answer was something that I could in no way verify? If the voice was from God, then no problem, but I have absolutely no way of knowing this at all, to this day. It could be just as easily stated that the voice was gently guiding me down a path that at first seemed to be the correct path, only to find out later that I was being directed to a path that was far from God. By then, who knows how far away from God I would have been taken, simply because I was getting used to following a “voice” that seemed to be “of God”? This is the problem with voices, signs, wonders, and dreams. How are we to accurately interpret them? In the Old Testament – and even in the New to a certain extent – those folks did not have the Bible to refer to, which is at least why, in a few cases, “fleeces” were used by petitioners to God in prayer. Since there was nothing written down to which worshipers of the One true God could look, God chose – at that time – to use dreams, visions, signs, and wonders. He also used prophets whom He raised up to be His voice to many in the nation of Israel. Because there was nothing written to which those folks of old could refer to, it seems likely that God would have offered some measure of protection from the enemy to keep deception away. This was even done to some extent in the situation with respect to Balaam (cf. Numbers 22). God would only allow the deception to go so far and deliberately kept Balaam from being thoroughly involved in it. Yet today, people want the signs, the miracles, the voices, the dreams, the visions, the new apostles and prophets, in spite of the fact that we have God’s full written Word. Certainly, God uses our consciences and He clearly opens or shuts doors for us as He sees fit. We have the Bible as a main reference to learn more about God’s will for our lives today. It is through this written Word that we come to know Him because His (written) Word is “living and active, sharper than any two-edged sword, piercing to the division of soul and of spirit, of joints and of marrow, and discerning the thoughts and intentions of the heart,” (Hebrews 4:12). Paul also attests to this throughout the many epistles he wrote that comprise the New Testament. In spite of this, we want God to speak to us, reveal His will to us in dreams and visions just like the Old Testament and even in the New. Here’s the problem with the above chicanery constantly on display within Charismatic circles. John talks about how we are to love one another (cf. 1 John). He provides practical ways to love our brothers and sisters (as does James). Why is the associate pastor of that church standing there acting like a professional mind reader or psychic when he should be actually coming alongside people to help them in their weaknesses? People have real needs. Telling them to stop worrying or mentioning the number 3 is hardly loving. The local church is here to provide for Christians in need, at least on some occasions. The “food pantry” began in the book of Acts, folks. The apostles didn’t say to the people then, “Look, you need to stop worrying. Next! Okay, the number 31 1/2 should mean something to you. Next!” They actually did practical things that evidenced their love for one another. If you are not involved with a local body of believers, you are fully missing out on this very important aspect of Christian service! The reason we have fellowship with other Christians is to draw strength from their support and to be support for them when they need it. The Christian life is not meant to be a solitary life – just me and God! That was good for John the Baptist because he had a very specific calling on his life. The rest of us? It is a life of fellowship with other Christians who love the Lord and want to serve Him. Sometimes, serving Him means caring for our weaker brothers and sisters. Sometimes, it means being cared for by others. Reading how God works from His Word is just oh, so boring, isn’t it? People prefer circuses today and the excitement that goes along with it. In reality – whether they are willing to admit it or not – this desire to “know” God through external devices is really a “me” centered mentality that has grown out of the 1960’s and the Charismatic Renewal that occurred at roughly the same time. That “me” generation thing was not just something that caught the attention of secular society. It made its way into Christendom as well and here it remains. In the next article, I want to talk about a time when I believe that God did speak. He did not speak in any audible way, but through action, and concerns the death of my sister. Entry filed under: christianity, Cultural Marxism, Demonic, Emotional virtue, eternity, Political Correctness, Politically Correct, Politics, Religious - Christian - End Times, Religious - Christian - Prophecy, Religious - Christian - Theology, salvation. 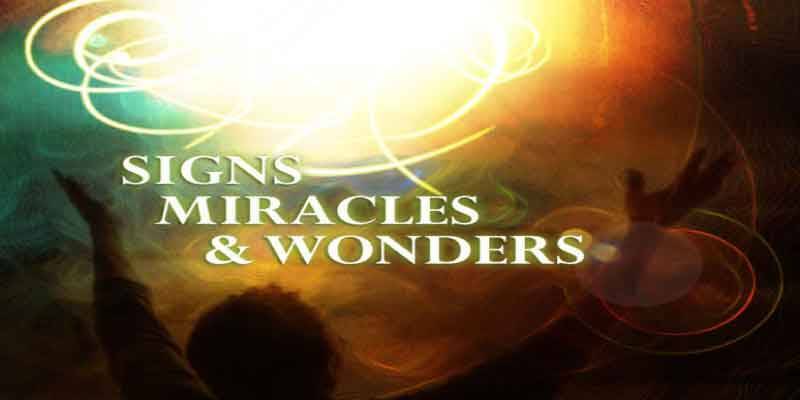 Tags: charismatic movement, charismatic renewal, dreams and visions, miracles, signs and wonders, voices.